The Twix candy bar is a butter cookie topped with a thick layer of caramel and the whole bar covered in dairy milk chocolate. Twix candy fingers are about four inches long, and half an inch thick, and two of these are packaged together in a single wrapper. The Twix brand is owned by Mars, Inc who are one of the largest confectionery manufacturers globally. First created by Mars Limited in the UK in 1967 at the company’s Slough factory which is also where the current Mars Bar was invented by Forrest Mars Sr. in the 1930s. The Slough factory is also the home factory of the popular Starburst, Skittles, Snickers, and Topic brands also owned by Mars, Inc. In the years after its creation the Twix candy bar was released throughout Western Europe under the name Raider. A period of continuing sales thru the early 1980s would have suggested Mars, Inc were happy with the performance of their Twix brand, in fact the candy bar wasn’t performing quite as well at retail and the hunt was on for a replacement or improvement which in 1983 came about with the peanut butter Twix. The caramel was removed and a soft peanut butter blend added. The market reacted very positively. During 1991 Mars rebrand the Raider chocolate bar to Twix in line with their global branding but the the decision meets with public scorn. An advertising campaign with the slogan “Raider heißt jetzt Twix … sonst ändert sich nix” roughly translated as Raider is now Twix, nothing else changes. Public reaction saw the change as a cynical attempt to revive sales of an old product by rebranding it, so much so that the name Twix has become synonymous with cynical rebranding in both politics and the corporate world in Germany. The 1990s were a period of great experimentation for Mars, Inc and the Twix brand in particular with several new varieties coming to market, some of which have remained in production, and helping to turn the Twix brand into one of the core chocolate confectionery brands of Mars, Inc globally. New flavors and varieties brought to market included cookies and cream, fudge, dark chocolate, white chocolate, mint slice, coffee, orange flavor, triple chocolate, and most recently Twix Java and Twix Cappuccino. As part of the strengthening of the Twix brand and Mars, Inc’s overall product development Twix was chosen during the early 1990s as one of the brands that would be reworked to compete in the ice cream space with frozen Twix bars making their way into supermarket and mall ice cream vendor ice boxes. The individually wrapped bars were popular and lifted sales of Mars branded confectionery outside of their traditional markets. 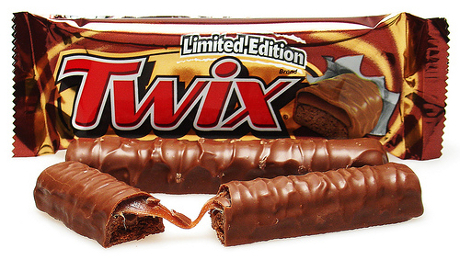 The last major controversy surrounding the Twix brand occurred in 2007 when Mars, Inc in Europe started replacing the whey used in their candy bars with animal rennet leading to a large protests and negative press publicity against Mars, Inc by vegetarians who previously were loyal to Mars candy because it was vegetarian. In late 2007 Mars, Inc agreed to stop using animal rennet in their candy and revert to their old recipe but in 2008 a whistle blower confirmed that animal rennet was still being used despite assurances to the contrary. i am too cheerful to share my know-how here with colleagues.